Here is another really great palette for the price from this line. $5.80 is the price point, and it's worth every penny. The pigmentation on these shades is very good ( a couple of the shades are a little "soft" but I can work with that for the price). You just can't go wrong with these palette's. 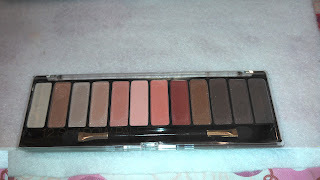 They have lots of color options, and they are easy to blend and are quite pigmented. Do you own any of the makeup/beauty items carried by forever 21? What do you think about them?